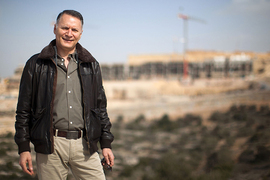 Bashar Masri is the Chairman of the Board of Massar International, a company he founded in 1994 to realize his vision for private sector development to serve as the path (“massar” in Arabic) leading to Palestinian economic development and growth. He actively promotes Palestinian private sector business opportunities to companies and individuals across the globe. Mr. Masri is the visionary and catalyst behind Rawabi, the first Palestinian planned city and the largest private sector undertaking of any kind in Palestinian history. Rawabi, as the cornerstone of a new, modern and viable Palestinian society, has garnered the attention of world leaders and business pioneers alike. Mr. Masri also founded and manages Palestine’s first private equity fund, the Siraj Palestine Fund, a $90 million investment initiative created to invigorate and vitalize Palestinian businesses in every sector of the economy. The Siraj Fund has attracted prominent international investors, including the Overseas Private Investment Corporation (OPIC) and the Soros Economic Development Fund. In the past decade, Bashar Masri has launched a diverse range of Palestinian start-ups in the fields of journalism, financial services, communications, and advertising, and information technology. Regionally, Mr. Masri has spearheaded large and economically significant investment projects, including affordable housing communities in Morocco, commercial and residential developments in Jordan, and a residential/recreational real estate project in Egypt. Under his energetic leadership, the Massar International global portfolio now includes more than 15 successful and fast-growing subsidiaries. Named by the World Economic Forum as a “Global Leader of Tomorrow,” Mr. Masri also serves on the board of numerous private companies and philanthropic organizations, including the board of trustees of Al-Najah National University, chairman of the Palestinian Distribution and Logistics Services Company, (PEX: WASSEL) and vice chairman of the Palestine Mortgage and Housing Corporation, (PEX: PMHC).